I'm here today to give you an early announcement of a publication due out later this year. 'Beyond the Mirror Image' is a thorough history of Quantum Leap, from its conception through to the present day, primarily in the form of an episode guide, but also with various essays and an estensive set of appendices. It's a fan publication unlike any that have come before it, and I'm really excited to get more information out to you. 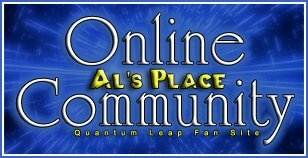 The press release and social media campaign will be coming over the next six weeks and I'll make sure Al's Place is always a step ahead, in recognition of the years of work you guys have all done in keeping the flame of the show alive. Last edited by MattDale; 06-10-2016 at 01:40 PM. Welcome to Al's Place, Matt and good luck with the book. With usual bad timing, I've recently disposed of my old original video recordings from Sky TV. I went through episode by episode comparing them to the dvd versions, and converted those with different music etc. If you have these, and I could pick your brains a little, I'd really appreciate it. There are very few props that were specific to the show. The most obvious, of course, being the various Handlinks that Al used. Owners of three or four of the later "gummi bear" style are known. One hero Handlink is owned by Deborah Pratt, along with Al's neon star pin seen in the pilot and two other early episodes. Dean Stockwell also still has one of the hero Handlinks. Evidence strongly suggests that there were only two hero Handlinks in the gummi bear style, so that accounts for both of them. A photo of one background or stand-in version was posted online by owner Gene Crowell. An extensive photographic study of another background or stand-in gummi bear handlink was posted online by Mike Moore of HMS Creative Productions. Maybe he can tell you who owns it. I believe the first gummi bear handlink shown, from episodes "The Great Spontini" and "The Boogiem*n", was later "redressed" by adding a piece to make it thicker and painting it, as well as installing a motorized armature to the front and a belt clip to the back. This then became the "Gyrograph" prop from the episode "Future Boy". That prop is now also privately owned, but I don't know by whom. The "Wristlink" from "The Leap Back" has been sold at auction at least twice and was recently on display in a sci-fi museum, I believe it is called the EMP Museum (don't know what that stands for). It may still be there. As far as I'm aware, nothing is publicly known of the fates of any of the earlier "calculator" style Handlink props, of which there were at least four versions made. The "Evil Leaper" observer's Handlink has also been sold at auction, so it's out there somewhere. I read here (link) that some of Al's costumes were in an exhibit hosted by the Fashion Institute of Design and Merchandising museum in 2006. Perhaps someone there can tell you where they might be now. Other costumes from the show would mostly have been mere "period" pieces that wouldn't stand out as being anything very special if, for example, someone came across something in a shop somewhere. So there doesn't seem to be anything publicly known about them. Last edited by Scotophor; 06-09-2016 at 01:14 AM. Thanks Scotophor, that's fascinating. Certainly goes a way to explain why, having worked on this project for over a year now, details about props and costumes are still a little scant for me. You've certainly helped fill in some gaps though, that's great! There are very few props that were specific to the show. The most obvious, of course, being the various Handlinks that Al used. Owners of three or four of the later "gummi bear" style are known. One hero Handlink is owned by Deborah Pratt, along with Al's neon star pin seen in the pilot and two other early episodes. Dean Stockwell also still has one of the hero Handlinks. Evidence strongly suggests that there were only two hero Handlinks in the gummi bear style, so that accounts for both of them. A photo of one background or stand-in version was posted online by owner Gene Crowell. An extensive photographic study of another background or stand-in gummi bear handlink was posted online by Mike Moore of HMS Creative Productions. Maybe he can tell you who owns it. I believe the first gummi bear handlink shown, from episodes "The Great Spontini" and "The Boogiem*n", was later "redressed" by painting it and adding a piece to make it thicker, as well as installing a motorized armature to the front and a belt clip to the back. This then became the "Gyrograph" prop from the episode "Future Boy". That prop is now also privately owned, but I don't know by whom. The "Wristlink" from "The Leap Back" has been sold at auction at least twice and was recently on display in a sci-fi museum, I believe it is called the EMP Museum (don't know what that stands for). It may still be there. Thanks Hayden - I'd been meaning to chat to you for a while now actually, as I know you from your work on the Podcast and it'd be great to be able to bounce a few things around with someone as minutia-obsessed as me. Would you mind chatting over email (matt@tmebooks.uk)? If you can drop me a note to say hi that'd be great. If you know where to look, the entire series can be acquired in High Definition scanned from the film negatives. Other than an incorrectly-colored leap-in on the episode Hurricane, some dodgy upscales of leaps (A Leap for Lisa and The Evil Leaper being particularly fuzzy and low-res), and the Pilot episode being a syndicated cut, the episodes are uncut and appear with the original music. At this point there's not really a dire need to retain off-air recordings. Australia has seen the first season of QL released on Blu-ray and they corrected the Pilot episode to be the original cut. I believe the second season is due -- later this year. I'm tempted to buy them despite the high price and region lockout (I'd have to transcode the videos into region-free MP4 or H.265) just to see if there is a marked improvement over the download versions from iTunes and Amazon Instant Video. At the very least I'd have the corrected Pilot episode. Last edited by feldon30; 06-18-2016 at 10:06 PM. Australia has seen the first season of QL released on Blu-ray and they corrected the Pilot episode to be the original cut. I believe the second season is due this month. I'm tempted to buy them despite the high price and region lockout (I'd have to transcode the videos into region-free MP4 or H.265) just to see if there is a marked improvement over the download versions from iTunes and Amazon Instant Video. At the very least I'd have the corrected Pilot episode. Believe it or not, since starting this project, I've bought up complete DVD collections from the US, UK, France, Germany, Holland, Italy and Australia, along with the recent Blus (I HIGHLY recommend them - they're a great upgrade) and iTunes. You'll find very specific notes in the guide about what the differences are between each one - and it goes beyond the controversial music I agree, in terms of what's 'needed' in order to have a perfect collection, the HD transfers are great. The first "Evil Leaper" observer's (Zoey) Handlink has also been sold at auction, so it's out there somewhere. I have also seen a very accurate replica of this rather simple design, so beware of the possibility of a forgery masquerading as the original. In the third installment of the "Evil Leaper" trilogy, Zoey has been promoted from observer to leaper, and a new character, Thames, is introduced as her observer. Thames uses yet another previously unseen handlink design. I have never seen that handlink elsewhere, so it's also a "fate unknown" prop at this time. I'm unsure how to share it with you but I own a bootlegged set of the series as in my anxiousness I'd purchased it (not at the time realizing exactly what it was) prior to the official DVD set release of season 4. All episodes or at least some appear to be recordings of the original or early airings as I've noticed a few things in particular. - 'Thou Shalt Not' contains a brief second of a McDonald's commercial and another episode I don't recall which, contains a full A&W commercial. - The 'MIA' credits included an announcement of the show coming on next (Star Trek, I believe). - I believe channel logos are present in the corner of the screen in at least some episodes. - All the original music is intact and I believe 'MIA' contained scenes deleted from the official DVD release. I remember the last time I watched it there were various moments that felt unfamiliar to me and that has always stuck with me. Unfortunately, a large chunk of the set, all of season 1 and roughly the last half or so of season two have been lost and a disc in season 5 was damaged causing the content to be unwatchable due to constant freezing. Also, the last disc of season 4 episodes is replacing the equivalent disc in my official set as the official disc was accidentally sent to Netflix several years ago and the episode 'Roberto' has since become unwatchable due to constant freezing but accompanying episodes are fine. I also favor my bootlegged 'Temptation Eyes' as I can't stand the replacement music. The image quality is very low but I care not, I greatly value what of the set I still have and miss what of it that I lost (especially 'MIA', I was distraught when I couldn't find it after turning my bedroom upside down), they have sentimental value to me. Thanks SBF! Have PMed you. We'll be posting some exclusive updates there over the coming weeks, leading up to the Kickstarter campaign in August. After a year of teasing, I'm thrilled to be able to finally release an extract from Beyond the Mirror Image. This analysis of Genesis is free for members of the Al's Place forum and followers at facebook.com/qlbtmi, with more exclusives coming over the next few weeks. Text and layout are still technically "in draft", and there will be further tweaks prior to publishing, but this should give you a flavour of the level of depth the book goes into. I really hope you enjoy, and keep coming back for more. The crowdfunding campaign to get the whole book released begins 4 weeks today! Very excited that my proofreader copies arrived today! These have a very rough design/layout, and unfinished cover art, but enable two of us* to more easily check for typoes and other errors that can be missed when looking on the screen. Thrilled to see it 'in the flesh' after all this time, and so close to being something we can get into your hands! *I have four eagle-eyed proofreaders in total, including the fabulous Leaper1 and Lightning McQueenie from this very forum, who are working from electronic copies to help ensure this is the most accurate and comprehensive book on QL. - Proofreading is progressing well, and we're ironing out all the kinks. - The Kickstarter page is up in draft form, and will be submitting to KS tomorrow for approval. They take up to three working days to do this, and then I'll be able to provide you with a link next week, to tie in with Sam's birthday! - The only thing pending for the above is the promo video, where you'll get to see me flapping on about my motivation for the project and my passion for the show. Once we've got the promotion started, I'll be able to go back to start providing some more extracts, as I'd love you to see a few more pages. More information and resources keep coming to light, so the book is getting bigger and heavier. No stone is being left un-turned! Thanks! Launching 10am Monday (UK time) to celebrate Sam's birthday! There will be a limited number of discounted copies for early pledges. I'll post the link here as soon as it's available. It's August 8th. Happy birthday, Dr Beckett. We're live! This first edition is only available for pre-order until the end of the month! Please share this link far and wide. Not only is the pledging period brief, but within that time we have to receive at least 40 pre-orders, or we won't be able to print any of them. If you want your copy, tell your friends about it too. 1. Visit https://www.kickstarter.com/signup and register. They'll ask for a username and password, along with shipping and billing details. It's just like you would at Amazon. Simple! 2. Visit https://www.kickstarter.com/projects...e-mirror-image and 'pledge' for the reward you want (you can watch a video of me talking about it too!). Here's where you choose what you want back from us. There's a few choices! 3. Sit back and wait. Your card will not be charged until 1st Sep (or soon after). If for some reason we do not receive enough pre-orders, your card won't be charged at all and you will receive an update from us by email. 4. Meanwhile, we will continue to work on the book and aim to have it shipped before the end of the year. Just a quick update: We are funded, so this book will be going to press, but there are only 19 days left to get your orders in. We don't know if/when there will be another print run - it really depends on interest - so please get your orders in now rather than risk disappointment later! More PDF extracts will be following the next couple of weeks to whet your appetites too! Less than 24hrs to go to pre-order the book that made Christopher DeFilippis ask "are you insane?!" We don't have current plans to reprint, so go to the Kickstarter if you want to be sure of getting your copy of this lavish celebration! I'm looking forward to reading this; it sounds very awesome. I never understood why Universal never did a book about this show, and only brought Scott and Dean for extras about the first year. I was blessed to have met Dean at a convention in Dallas, maybe five or six years ago; he was kind but also seemed tired. I remember asking what his favorite episode was from each season; the only one he cited was "The Last Gunfighter". After his Q&A session, I asked for his opinion on so many celebs complaining these days, regarding a lack of privacy. He simply shrugged and said, "its part of the job". I still have this awesome 8x10 that he signed for me; hoping to meet Scott Bakula someday, too! I now have my copy and it is AWESOME! Mine finally arrived, and it's as big as my head! Such an awesome read awesome job Matt and company!! !